A wide shot of Niagara falls. Rochester, New York, and its surrounding area offers plenty when it comes to day trips. Located on the southern shore of Lake Ontario, this city on the western end of New York State is perfect for those who are looking for culture, outdoor activities and the opportunity to try new things. Through this article you will learn of several day trips that will get you off the couch and on the road to have a great time. 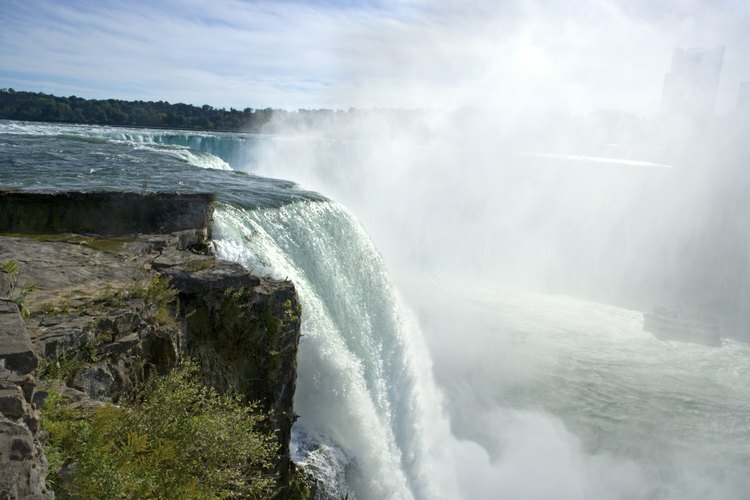 It might seem hard to believe, but Niagara Falls, New York, is only a 90-minute drive from Rochester. By taking the beautiful Seaway Trail, you will find yourself in Niagara where you can tour the falls at Niagara Falls State Park. The park offers the ability to explore the Cave of the Winds, a gorge below the falls that will take you to the Hurricane Deck--be prepared to get soaking wet. Also available are Goat Island, Luna Island and Prospect Point containing awe-inspiring views, restaurants and theaters to complete the falls experience. The best part of Niagara Falls State Park is a majority of features are accessible by ferry or trolley, allowing you to travel around the park with ease. The Great Lakes Seaway Trail runs from the Lake Erie Region straight through to Alexandria Bay and beyond. This scenic route provides opportunities for several day trips to locations such as the Lockport Cave and Underground Boat Ride, scuba diving in Dunkirk or Pultneyville and skiing in Clymer at the Peek&rsquo;n Peak Resort &amp; Spa. Whether you are looking to stay in Rochester or leave town, there are several museums that will cater to a variety of interests. Right in central Rochester is the George Eastman House--the founder of Kodak. Among its historical walls you will find several rooms of photography equipment and innovations plus galleries of work. Located in Hammondsport, the Glenn H. Curtiss Museum houses impressive collections of early motorcycles and air crafts. Leroy, New York, houses every dieters dream dessert. The Jell-o Gallery Exhibit and Museum is open year round and features the history behind Jell-o and how it&#039;s changed over the years. Looking for something the kids will enjoy? The Strong National Museum of Play is located right in Rochester and is open every day. For an additional charge, you can have access to the Dancing Wings Butterfly Garden. Sacket&#039;s Harbor, just a little northeast around Lake Ontario and is host to Old McDonald&#039;s Farm. With more than 200 animals, a dairy tour and mini-golf, this farm will keep your family busy all day. Eating well on your adventure can be tough, but not impossible. Right in Rochester is the Natural Oasis Cafe, an Ethiopian Restaurant that is 100 percent vegan. Also available is Aladdin&#039;s Natural Eatery. Largely Greek based, this vegetarian restaurant serves some the best food in Rochester. Both restaurants offer food to go. Traveling with omnivores? Try Breathe, Orange Cat Coffee Company, or Red Pepper Cafe. All of these restaurants are vegetarian friendly and are serving up healthy food and will substitute tofu in many of their dishes containing meat.